Many of the children in this kindergarten in Qaraqosh, Iraq, were infants when Daesh stormed this Christian city in the early morning hours of Aug. 7, 2014. They are lucky that way at least; they will never remember the night of terror their parents and other family members experienced as they fled the city. Hundreds of families, more than 200,000 from villages across the Nineveh Plains, escaped in those frantic hours—some just minutes ahead of Daesh, as everyone in this city near the border with Iraqi Kurdistan calls the Islamic militants known as ISIS in the West. They fled packed in cars and trucks; less fortunate ones fled on foot. Now, 17 months after the first of Qaraqosh’s wary residents returned to their old homes and a city in near ruin, the stores in the city center are open for business and families are out in the welcome cool of the early evening. They are shopping, heading to restaurants, arguing with friends or just enjoying a stroll. They must take care to avoid the construction debris all over the streets and sidewalks of the Iraqi city. There are so many signs of life in this community, like these schoolchildren. Qaraqosh is clearly breathing again, just as clearly as its many smoke-blackened homes, demolished shops and defaced churches attest that much more work lies ahead. Qaraqosh is clearly breathing again, just as clearly as its many smoke-blackened homes attest that much more work lies ahead. 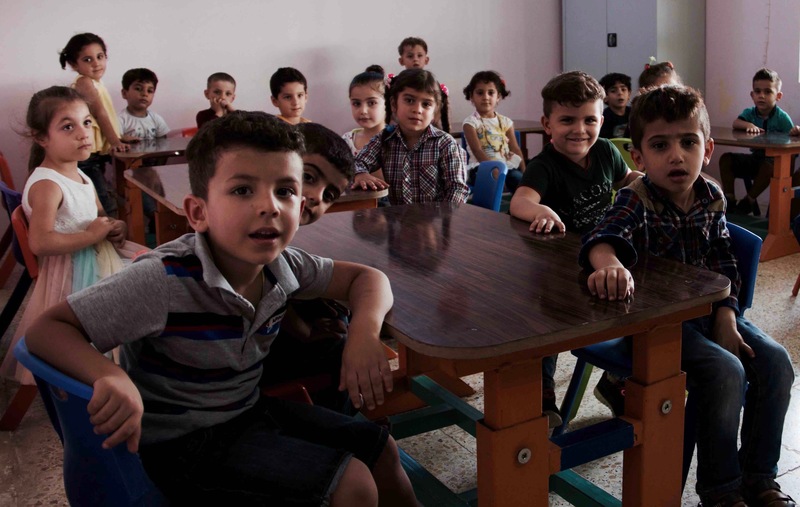 The kindergarten is sponsored by the Jesuit Refugee Service, which selected a site for the school near a low-income family apartment complex that is supported by the Syriac Catholic Church. J.R.S.-Iraq hopes to give the children of these poor families a decent start in life and a walkable location to begin their education. The 24 apartments in this modest complex that had been badly damaged by Daesh and the two units that had been completely obliterated by an Iraqi or U.S. missile strike have been restored. Bullet holes that pockmarked outer walls have been plastered over; exteriors have been brightly painted. The holes that Daesh blasted through adjoining apartment walls so they could move through the complex without being observed by sentinels flying above them have been repaired. Now scores of the complex’s former residents, mostly Syriac and Chaldean Catholics, are back in their old homes. Among them is Nahla Behnam Azo. She has returned to her restored apartment and is overjoyed to be home with neighbors that she loves. But her happiness is not complete. She has returned just with her son; her husband died last year after diabetes forced the amputation of both his legs. Though he may never be counted as a war casualty, she is convinced that the walking he did on his bad legs during the family’s flight to Erbil contributed to his death. Some will never see their homes in Qaraqosh again at all because they have gone to Europe, the United States or Australia, or have found good jobs in Erbil or Dohuk. When many fled Qaraqosh in 2014, they believed they were experiencing a one-or two-week annoyance, not beginning an odyssey of suffering that would keep them from returning for more than three years. Some will never see their homes in Qaraqosh again at all because they have gone to Europe, the United States or Australia, or have found good jobs in Erbil or Dohuk—gifts that cannot be ignored in these bleak economic times in Iraq. Shaheed Saad bakoos is not just the 25-year-old supervisor of the J.R.S. school and its 43 endearing students; she is also a child of Qaraqosh herself and excited to be home. She and her family, like hundreds of others, returned to homes that had been seriously damaged, if not ruined, by Daesh. Some homeowners only endured looted buildings or had to clean up after Daesh militants spent months squatting in their homes. Others lost properties that were burned by fires set by the fleeing militants or completely flattened by air strikes as Daesh was driven out of the city in October 2016. Shaheed says her family home had been stripped to the beams and burned by Daesh but has been nearly restored over the last year with the assistance of the local church. A two-year plan to rebuild the city is in its 17th month and has restored about 38 percent of the damaged homes. But Father George Jahola, president of the Church Supreme Board for the Reconstruction of Baghdeda (the city’s Assyrian name), worries that progress can remain on track only if more funding is secured. He is eager to persuade more former residents to return from the north, where they have taken refuge, with offers of help to rebuild and restore their lives in Qaraqosh. Of course, however much assistance he offers, many who have left will never be convinced to return. And many of the families who have made the difficult decision to rebuild, Shaheed knows, remain anxious about being back in Qaraqosh, worried that Daesh may one day strike again. An added bonus: she loves her new job. “The children are so happy, they always make me smile,” she says. "Iraq diary: Drinking sweet tea in West Mosul"